Our design is reminiscent of the original haute couture fashion designs, exclusive, elegant and timeless. 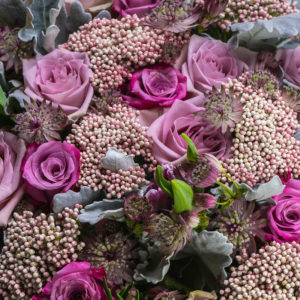 Glorious selection of the highest quality flowers available including silver dollar rose, maratima, silver leaf, ozmanthus and pink astrantia. 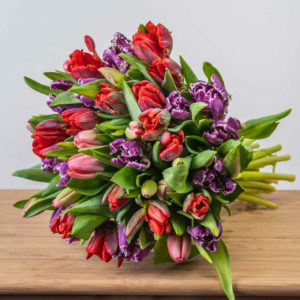 Striking ‘Spring’ tulip bouquet featuring the wonderful lush parrot tulips for flower lovers everywhere! 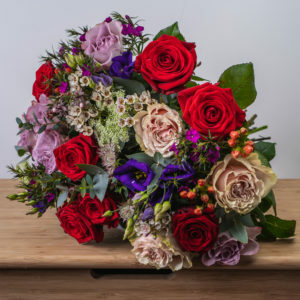 Inspired by all kinds of love, this has to be our Valentines favourite for 2019, a dramatic hand-tied bouquet crammed full of striking deep red Naomi roses, wild dille, memory lane roses, astrantia and hypericum to name but a few! 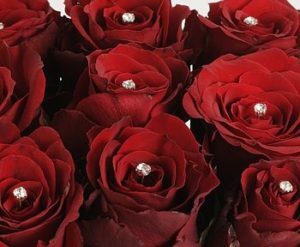 Beautifully presented luxurious long stemmed red rose especially designed for your special love. 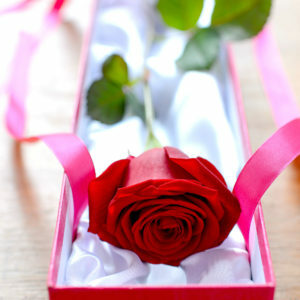 Your superior quality rose will be hand-wrapped and boxed with tissue & gift message. 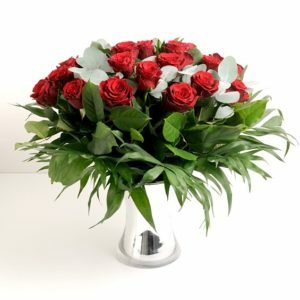 You can’t go wrong with this classic bouquet with 24 red roses playing centre-stage amongst a fragrant mass of garden style foliage. 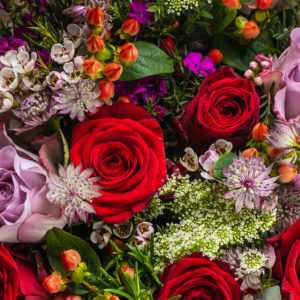 This is an impressive bouquet making the ultimate romantic gesture this Valentine Day. 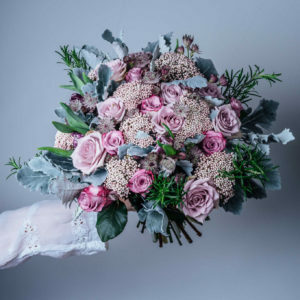 Each and every one of our bouquets is bespoke and truly unique, individually hand-made by our florist team just for you. 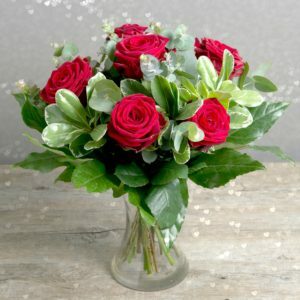 & Glamorous red rose luxury hand-tied bouquet with a wild flower edge! 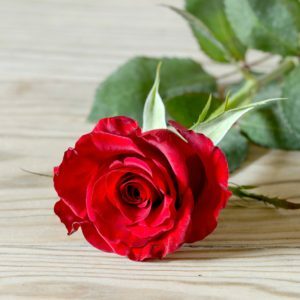 This simply beautiful long stemmed red rose and wild flower inspired hand-tie is a striking bouquet. 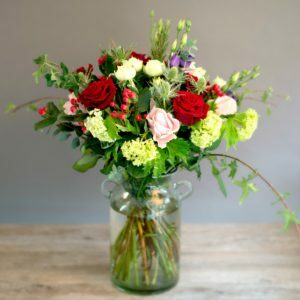 Wonderful blousey red & blush roses interspersed with garden spray roses and blue eryngium complimented with garden ivy complete the bouquet. 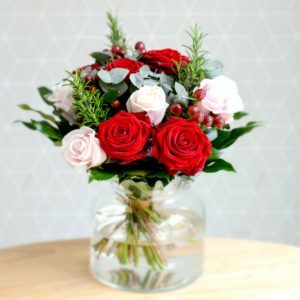 This gorgeous little rose posy comes with hand-placed little diamanté stud in each rose centre, hand-wrapped into a little bouquet with garden style foliage to complete the gift. 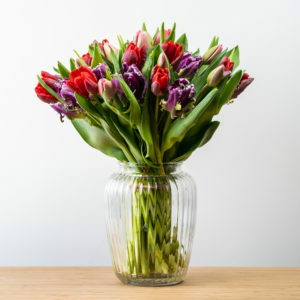 Your glass vase is packaged within the box for transit with a small amount of assembly on its arrival. 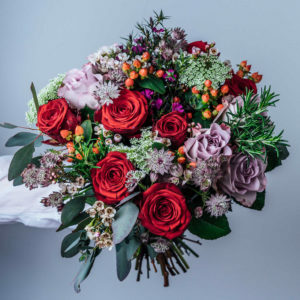 Exquisite blush pink and red roses sprinkled with scented herbs, hypericum nestled between fragrant foliage make-up this wonderful feminine rose bouquet looking as if just picked fresh from the garden. 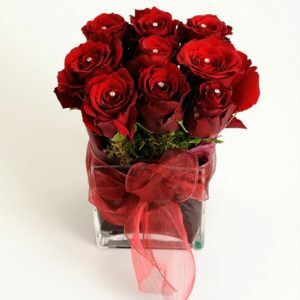 & You can’t go wrong with this classic red rose bouquet. Simple and beautiful, we’ve chosen the finest 6 Naomi roses and complimented them with some wonderful garden style foliage. 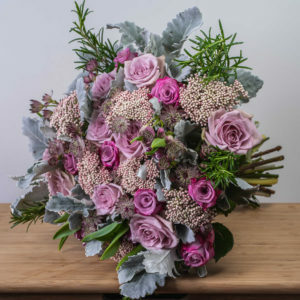 Each and every one of our bouquets is bespoke and truly unique, individually hand-made by our florist team just for you!